15 (Insanely Good) St Patrick's Day Recipes | Simple. Tasty. Good. March 17, here we are again! Hunting for St Patrick’s Day recipes and other delicious ideas as always. I combined some of my Irish (or Irish influenced) recipe ideas plus a handful of recipes by my favorite fellow food bloggers in this St Patrick’s Day recipes roundup. And I truly hope that I can be of some help to you this year! St Patrick’s Day is one thing. Irish cuisine is yet another bright spot in my never ending foodie universe. Tell me, what are do think of when you hear the words Irish cuisine or Irish food? Let yourself go, brainstorm for a minute. Guess I know what you are going to say after that: potatoes, cabbage, smoked fish, Guinness, soda bread and corned beef. Am I right or am I right? In case your mind went absolute blank there: don’t worry. That was what also happened to me a couple of years back when I first started food blogging. Saint Pea’s What? St Patrick’s Day! Hell I couldn’t care less. 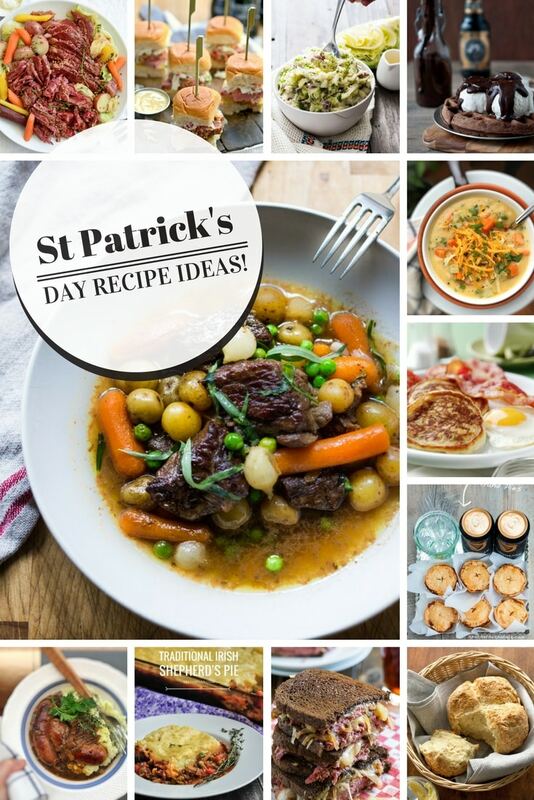 But the years after that around March 17 my Google plus foodie friends posted this wonderful avalanche of their most exquisite Irish cuisine and St Patrick’s Day recipes. Baby, that looked like a hell of a lot of fun back there. My first Irish cooking adventure was a (what else) a colcannon. I had heard of colcannon before, on TV. Guess it was on Masterchef UK. Looked like a fun kind of mash. Butter and cabbage too? Bring it on! Well, I plated the colcannon up and it was gone in just a blink of an eye. I assume that’s what they call ‘a huge success’. Followed by ‘we’ll make that again’. Boy, the most buttery mashed potatoes with some gorgeous crunchy bits of cabbage in it. Everybody around the table was sold right away. And this colcannon also was a superb side dish for my sausages in Guinness beer and onion gravy by the way! What’s St Patrick’s Day Exactly? But there’s far more than the classic colcannon if we’re talking about St Patrick’s Day recipes. Check my recipes below! I combined some of my Irish (or Irish influenced) nibbles and recipe ideas plus a handful of recipes by my favorite fellow food bloggers in this chapter. And before I call it a day here: any idea what St Patrick’s Day really means or where it comes from? March 17 is supposed to be the day when his highness Saint Patrick himself brought Christianity to Ireland. Hence St Patrick’s Day. Little remark: this day always pops up when it is Lent. That day though every little celebrating soul can let himself go and enjoy the Irish food and booze. The Irish, I love them! Let’s start off this roundup of St Patrick’s Day recipes with the essential, the most important Irish recipe if you ask me: a classic Irish stew! I love a good stew, especially if it has got lovely chunks of stewed lamb and potatoes in it. 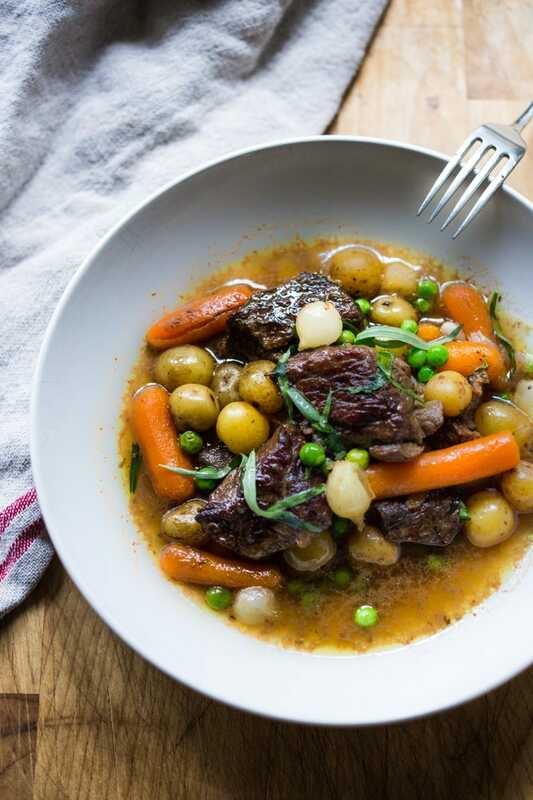 But this delicious Irish stew recipe from Sylvia behind Feasting At Home really draws me in big time: she also adds onions, carrots, green peas and… fresh tarragon. Tarragon! My favorite herb for lamb dishes! What a lovely flavor combo. Try this beauty, this almighty comforting stew features tender lamb shoulder accompanied by a colourful medley of wonderful vegetables. Well this is not the first time actually that I include a recipe from Heidi over at Foodie Crush in my roundups! Last time I mentioned her mozzarella crostini in my Super Bowl Appetizers. Those crostini attracted a lot of attention. 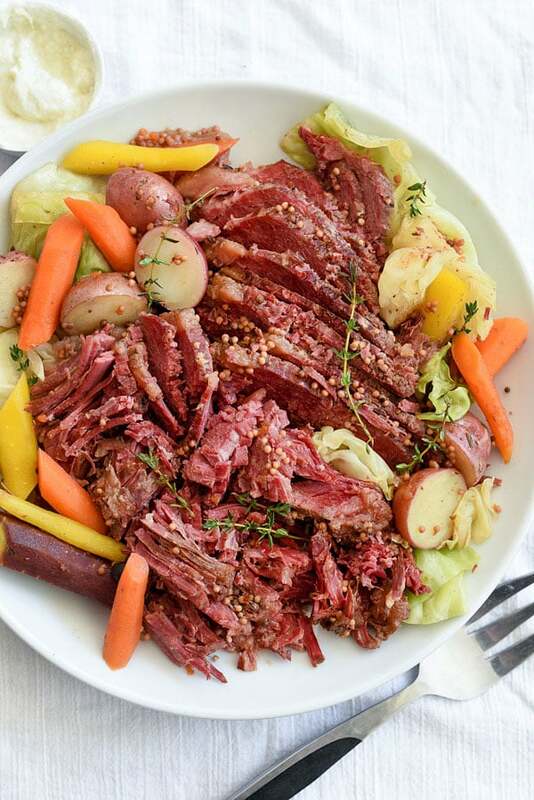 This year I picked her recipe for corned beef and cabbage for my St Patrick’s Day recipes roundup! Here’s the good news: you can prepare this corned beef in a slow cooker. Check! I couldn’t have said it better though. Let’s get this beef brisket cooking. What are you waiting for! 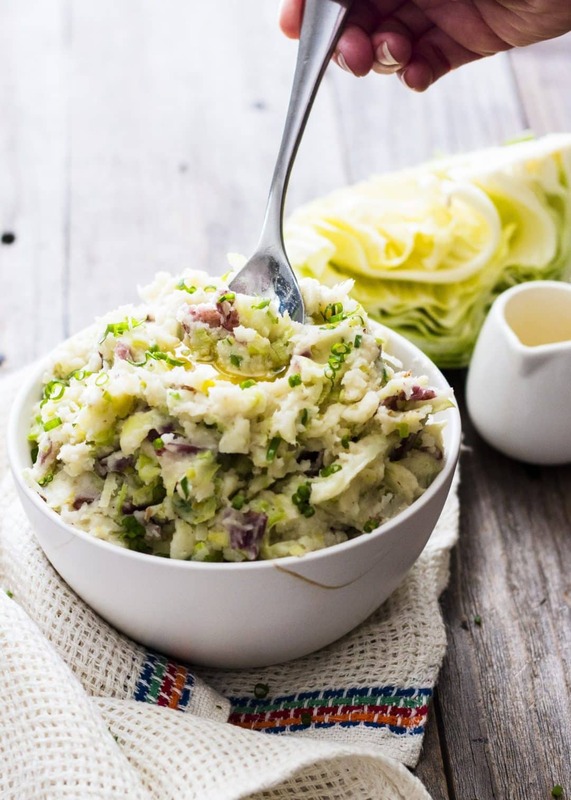 Donna over at Whole Food Bellies has this fantastic colcannon recipe. What I love in it the most to be honest? Those fresh leeks! I’m a huge fan of leeks. And I’m also a fan of mashed potatoes. Sounds like this colcannon is a perfect match for me! Yes, again I could not have said it better. What a lovely buttery St Patrick’s Day recipe. Thanks lovely Donna! Let’s sneak in a sugary St Patrick’s Day treat here, and allow me to show you one of my very own recipes! I was very happy of the way these chocolate Guinness cupcakes turned out in the end: beautifully risen, shiny tops, just the way cupcakes should look like! 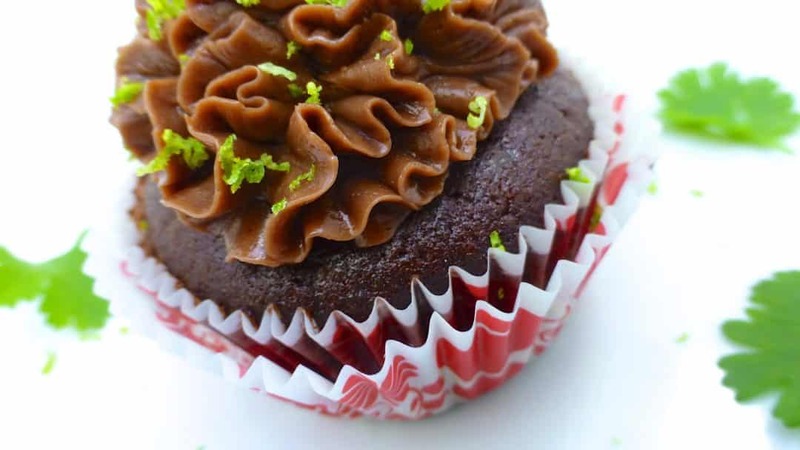 I made a buttery cocoa frosting to decorate them with and sprinkled them with grated lime zest as well. Just to give them a little green shamrock look. This cake batter is an absolute winner. Guess it is the sour cream that makes it so moist and shiny. I made cupcakes but go ahead and pour the whole chocolate batter in a loaf pan if you prefer! Slice it up, top with more sour cream… You will absolutely love it! Another déjà vu! It’s not the first time that I include a recipe from Becky down at The Cookie Rookie in my roundups! Last time I mentioned her bacon wrapped tater tots in my Super Bowl Appetizers. This year I picked her recipe for corned beef and cabbage sliders for my St Patrick’s Day recipes roundup! 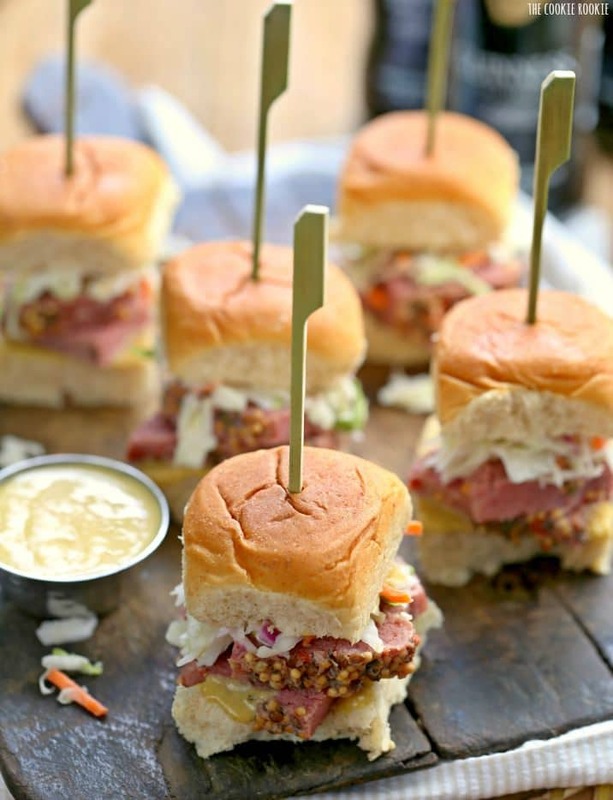 I really love Becky’s idea of making a cabbage and corned beef appetizer slider bite, not to mention that awesome looking Guinness mustard that goes with it. That beef brisket she uses looks so amazing. Stewed and simmered in a slow cooker for 4 hours? Has to be extremely delicious. Another great recipe idea by Becky, again! I have to admit that I fell hard for this next traditional Irish recipe. Shepherd’s pie! 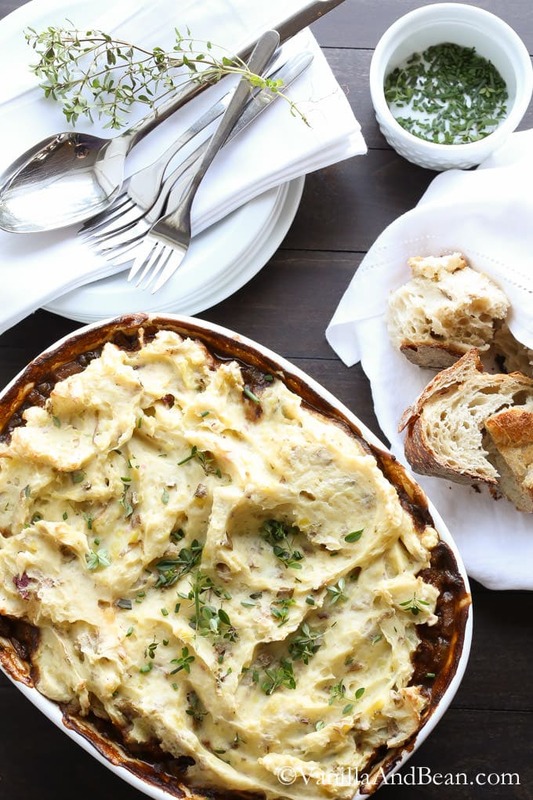 Sharon behind Street Smart Kitchen says it right: “A delicious and healthy traditional Irish shepherd’s pie recipe that will become a staple in your house if you give it a try”. And I couldn’t agree more. Look at that beautiful moist layer of carrots, peas, onions and ground beef. 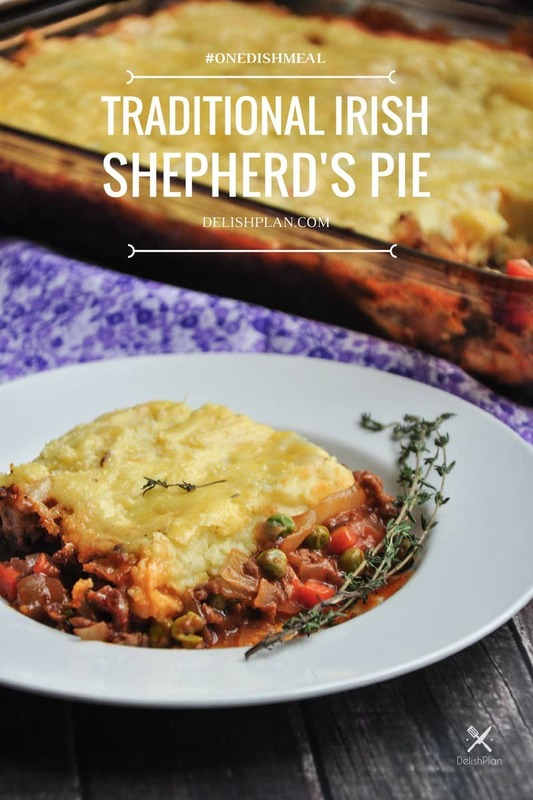 And how I love the addition of the tomato paste and worcester sauce to give this shepherd’s pie that little extra flavor! Imagine all these delicacies are topped with the traditional layer of homemade creamy mashed potatoes. Gosh, that just sounds like pure heaven if you ask me. What a wonderful St Patrick’s Day recipe this one is, thank you Sharon! 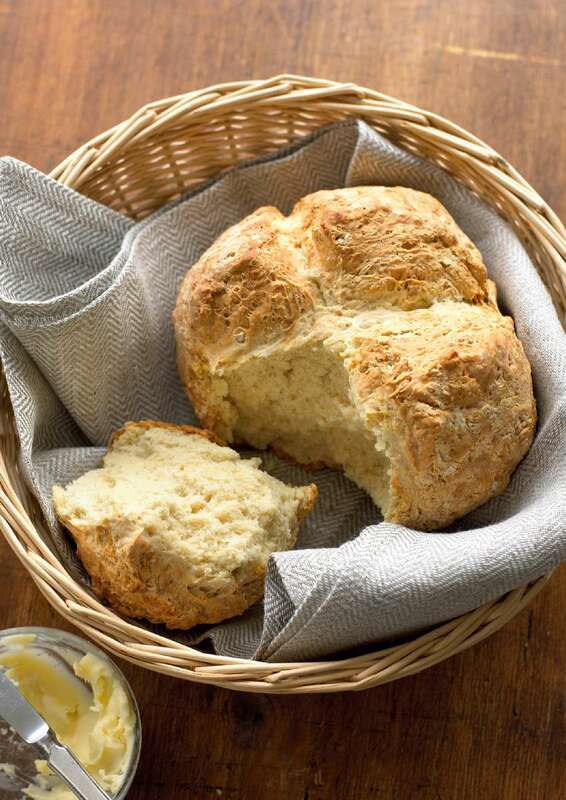 Soda bread is quick and easy to make. It’s a variety of quick bread traditionally made in a variety of cuisines in which sodium bicarbonate is used as a leavening agent instead of the traditional yeast. I like the look of the soda bread over at The Happy Foodie. Credits for this recipe go to Mary! The ingredients are pretty straight forward: strong white flour, bicarbonate of soda, buttermilk and salt. My husband is an avid baker of bread so I think I should show him this soda bread. The mash keeps piling up here, that’s the feeling I get when I scroll through my St Patrick’s Day recipes roundup so far! But hey, I love a good mash so you won’t me hear complain. Mash is one thing, but I also like a good silky gravy with that. And that’s what I get here in my personal bangers and mash recipe! 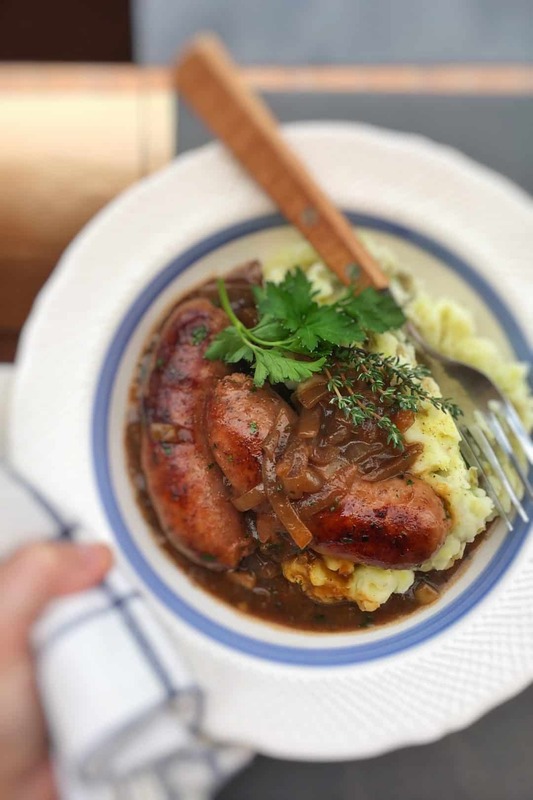 Just look at that buttery onion and Guinness gravy hugging those sausages and pile of mash! Highly delightful. The hubs and I never seem to get enough of this holy trinity: mash, bangers and gravy. But frankly, who could ever say no to this one? Here’s a question for you: have you ever wondered why sausages were called bangers? You can read the meaning behind them in my recipe introduction, take a look! Potatoes again! Well it’s not a mash this time, but lovely crisp and at the same time smooth potato pancakes. 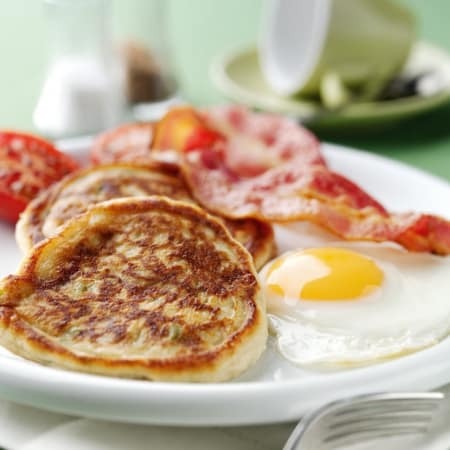 Boxty is a traditional Irish recipe that contains a mixture of grated potato and mashed potato. That’s why you get two different textures in it. And yes, these are perfect for a filling fry up breakfast with crunchy bacon, baked tomatoes and pan fried eggs. Check out this boxty recipe from Red Online. I once read that there is even an old Irish limerick that says if a woman can’t make boxty, she’ll never find a husband. Guess it’s time for a couple of pasties right now! 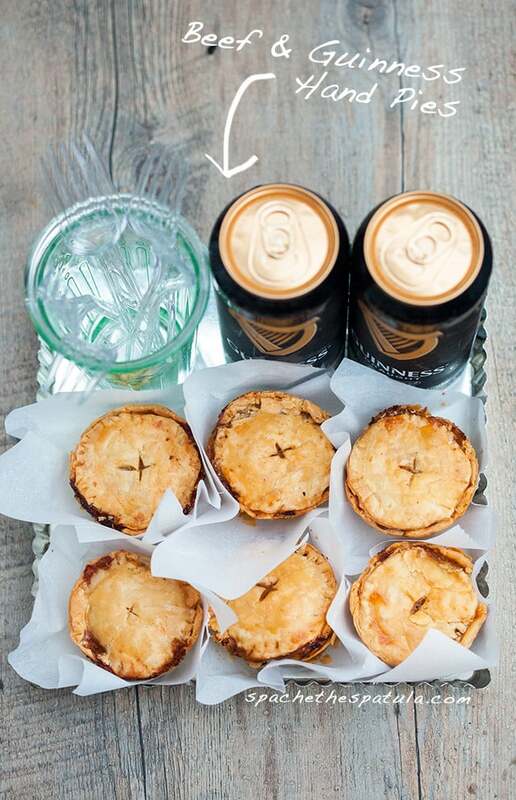 And guess what: I find just what I am looking for over at Spache the Spatula: these beef and Guinness hand pies look amazing. Downright gorgeous. How I love that rustic look they have. Thanks for the inspiration, Rachael! So let’s see what goes into them then. Ground beef of course. I also read carrots, onion, tomato paste, Guinness, green peppercorns (oh I like that idea!) and Worcester sauce. Are you still there? Getting a little dizzy after all that slow cooked meat, cabbage and mashed potatoes? 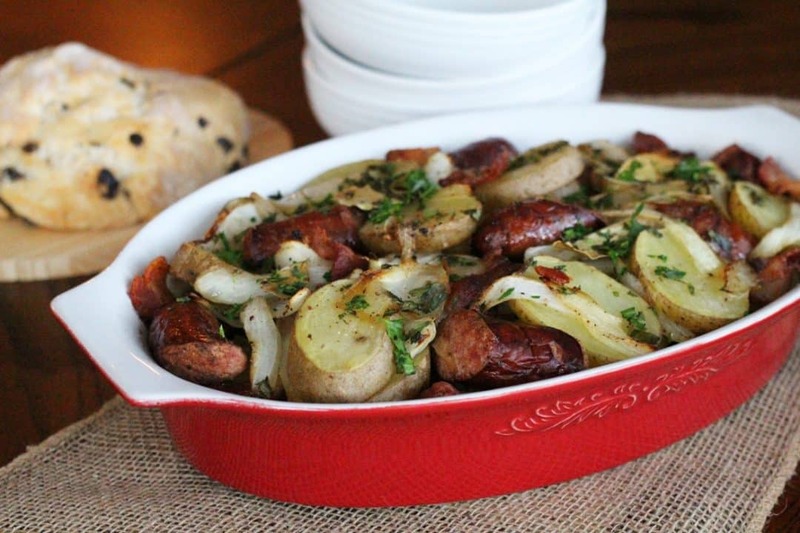 Oh hey, perhaps you are looking for a vegetarian St Patrick’s Day main dish! Then I got some good news for you: check out this vegetarian cottage pie by Traci who’s behind the lovely recipe website called Vanilla and Bean. Oh and this recipe also has vegan and gluten free options! Told you Traci got you covered. So what’s in that vegetarian cottage pie filling then, I can hear you ask. Let me take a quick look for you here: so we got French lentils, wild mushrooms, dried mushrooms, onion, parsnip, celery and carrots. Wow, I love the idea of adding parsnips to this pie! Love beer and cheese soup? Have you ever tasted it before? Maybe you have even prepared beer and cheese soup before? Well I love a good beer and cheese soup. Especially when it’s a bit cold outside, makes a lovely warm and filling lunch soup. 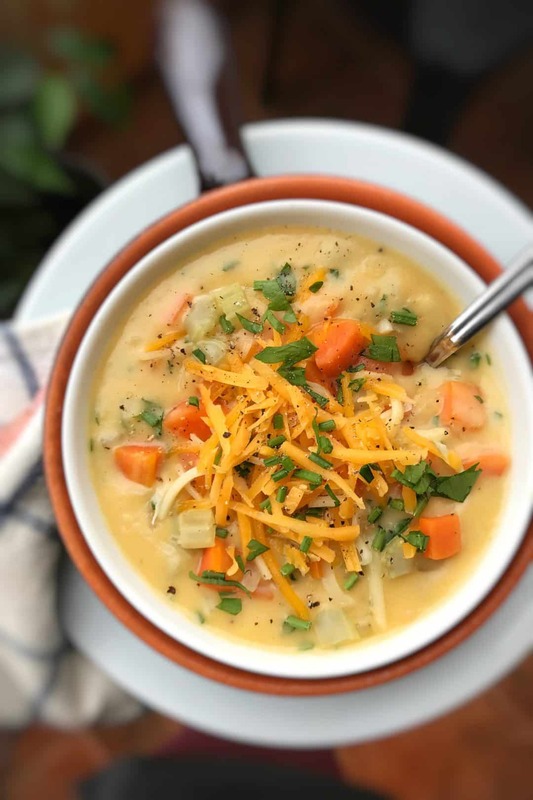 So here’s my personal recipe for beer and cheese soup with carrots, celery, onion, mustard, Guinness beer and cheddar cheese. Believe me, this beer and cheese soup is very easy to make. Yes, number three! It’s not the first time that I include a recipe from Melissa behind Melissa’s Southern Style Kitchen in my roundups! Last time I mentioned her cheesy dijon sausage appetizers in my Super Bowl Appetizers. This year I picked her recipe for a classic Dublin coddle for my St Patrick’s Day recipes roundup! So what is this coddle then? It’s a traditional bacon, sausage, potato, and onion stew that slowly simmers in the oven for almost 2 hours. There a re many variations on this classic. Sometimes ham is added instead of bacon. Best side for this heavenly stew? Soda bread of course! Thanks Melissa, as always! Oh. My. My stomach really starts to rumble now. Just look how awesome these corned beef grilled cheese sandwiches look! Who on this earth could ever resist the temptation of this stack of salty corned beef, topped with sweet caramelized onions, and gooey melted cheese? Credits for this beauty go to Christin who is behind Spicy Southern Kitchen. And she’s definitely right: this is perhaps the best way to eat corned beef. Nope, I won’t disagree at all. Count me in! 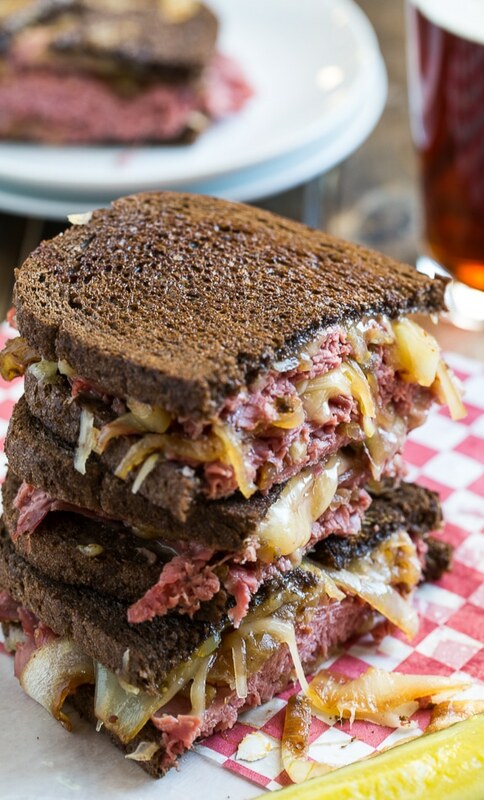 Well it’s not only that corned beef that makes me extremely happy, or the salty caramelised onions and cheese that attract me: I have a soft spot for pumpernickel black bread. Christin, you are killing me. Thanks! Let’s end this St Patrick’s Day recipes roundup with a huge bang! I would love to know what you think of this next sweet treat: chocolate stout waffles sundae with chocolate stout fudge sauce. Now that’s a mouthful, don’t you agree? Literally and figuratively even. These waffles look and sound just delicious. I don’t think they need a lot of introduction, you surely don’t need to be talked into trying out this recipe. Jackie behind the famous The Beeroness website got you covered for this one. Just check out the recipe, that’s all I can say. You will love it. 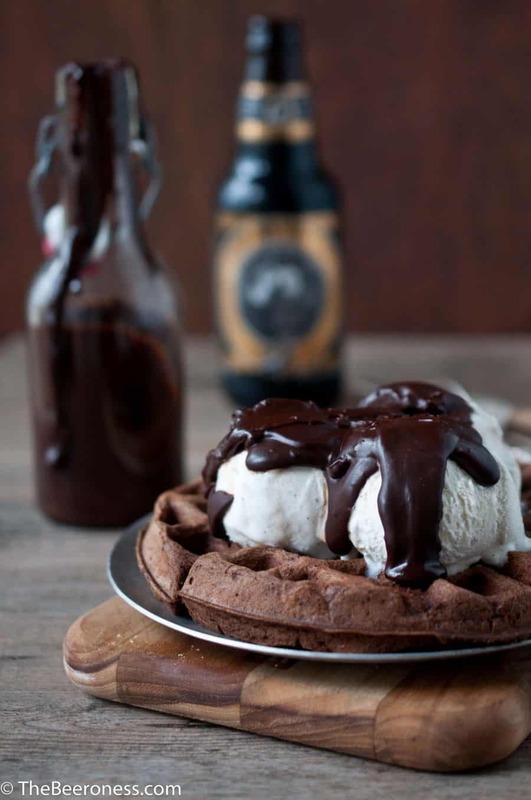 Stout waffles, ice cream and chocolate stout sauce? Speechless. Thanks Jackie!